So last weekend we went off for a trip to Buenos Aires. I booked the flights with Avios points from BA, and at the time of booking the only flights available were via Qatar Aiways via São Paulo in Business Class. Although it might seem like a bit of a waste of Avios (30k each return for a less than 3 hour flight), it was an easy opportunity to check out Qatar’s (older) business class product on their 777, and also a nice way to go on my weekend holiday. Indeed, there weren’t any stand out cheap flights, or direct flight options available that were well timed for me anyway, so going via SP GRU wasn’t adding any inconvenience either. We arrived at São Paulo’s international airport, GRU, flying a quick TAM flight from Rio Santos Dumont with around 2.5 hours to spare before the flight. Check in was quick, with a single desk processing Business Class passengers (given the short flight, with SP being just a brief stop over on the flight from Doha to Buenos Aires), I’m guessing they don’t get many Business Class passengers generally. Passengers have a choice of three lounge options at GRU, which I’ll talk about in another post. We boarded around 45 minutes before departure, and I was greeted by name as the plane door, and escorted to my seat by a crew member, who stood attentively by to take my jacket, assist me putting away my bag, and getting me a welcome drink. My first thought was ‘wow, I wasn’t expecting such attentive service in business class’. Around ten minutes later the menus were distributed, and a few minutes after that the crew came round to take the orders. This time there was no being greeted by name, just ‘sir’. However, the service was efficient and friendly. The wine choice was also taken at this time. I selected the butternut squash pasta for my main, and it was ok, but nothing particularly special. I paired this with the chardonnay, the Bouchard Père e Fils. The same can be said for the desserts, ok but nothing that special! One of the wines wasn’t available, as I tried to order the Gewurztraminer to go with the desserts, but they only had the Riesling available as a slightly sweet wine. The service however was excellent, quite comparable with some of the previous First Class experiences I have had. But, it was over fairly quickly, with a flight time of only two and a half hours. We did have time to finish up with a digestif of an XO Cognac, which was very pleasant indeed. I was quite impressed to see an XO available in business class. After the first flight I thought I definitely want to try Qatar again, and was thinking of going out of my way to be able to fly on their A380 or A350 flights. But… as the title says, this is a tale of two Qatar Airways. The return flight from EZE to GRU was almost like flying a different airline. Gone was the personal greeting when boarding, or indeed any greeting at all other than being pointed down the aisle. Gone was anyone to take my jacket, or even to bring a drink – indeed after around 5 minutes, I had to flag down a member of the crew as she was walking by to ask for a drink and to get my jacket hung up. I didn’t at first notice the menus were actually already in the magazine holder area of the seat, but when the crew came to take orders and showed annoyance at the passengers on the row in front not having looked yet, I managed to at least look before getting told off myself! When she did arrive to take my order, pleasantries were not the order of the day, and she seemed somewhat taken aback by my answer to ‘what do you want for dinner’ was ‘good evening, how are you this evening’, prompting a slight break of the strict school teacher with a break out of a smile and a ‘very well sir’. I neglected to take any pictures at this point, as my phone had died and it seemed the USB port wasn’t working to charge it. However, I selected another pasta dish, this time in a tomato sauce. I think it was perhaps a little better than the way out. The wine list was exactly the same, and this time I paired with the Errazurriz carmenere. After the main, the crew arrived and collected my plate, then proceeded to take the cutlery, napkin and fold away my table for me. Now I didn’t actually want dessert as I wanted to try and get an hour’s sleep before we landed, but I wasn’t ever offered. My partner on the other hand did want, and had to ask if dessert was being served before getting his table re-set. There was no offer of further wine or a digestif. I haven’t talked about the plane and the hard product yet. The 777 has a 2-2-2 arrangement, and the seats are comfortable and spacious. However, I did find the bed position to be quite a bit off lie flat I thought, with a reasonable angle at the top of the body still. The massage function was interesting, in as much as you know when your seat partner turned it on! I could feel it quite significantly in my seat when my partner’s massage function was turned on – not that much of a problem if you know the person, but I could imagine it being awkward asking a stranger to turn it off, as it could be a little annoying. The seat has a fold down foot rest at the end, which I found to be a little bit on the short side for my 6ft, and when folded up the end of the seat I thought was then a bit uncomfortable due to the bulge from the foot rest being there. So an average hard product overall for me – I’m curious how it will compare to the Iberia 2-2-2 on the A340 which I’ll be flying next month. Both have a fully flat bed. Due to a plane swap, I’ve got the A340 instead of the A330 with it’s newer 1-2-1. Obviously, normally, you wouldn’t ever expect Iberia’s service to be even comparable to Qatar though, would you? I have had one stand out service though once, made by one fantastic crew member. 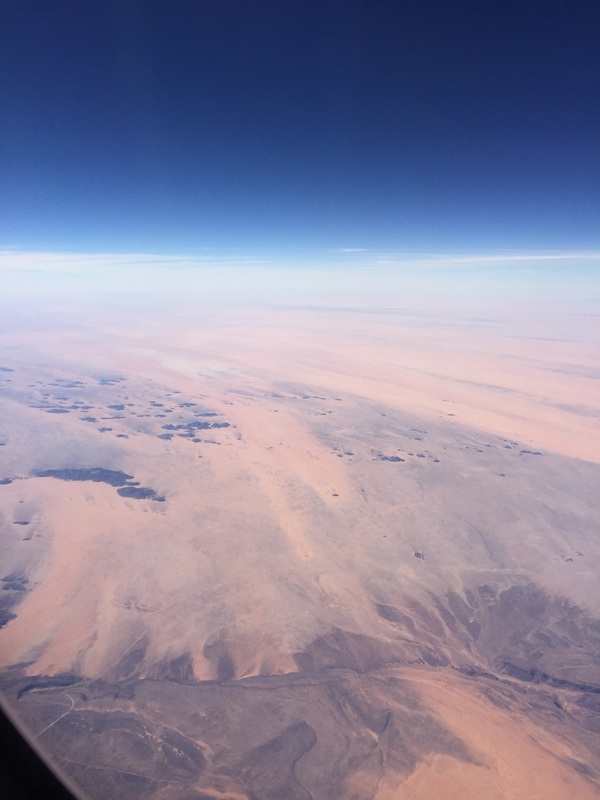 But back to Qatar… Really, the two experiences couldn’t be more polarised. One I can say the service was the best I have ever experienced in Business, the other is close to the worst I have ever experienced. Where does that leave me? Would I go out of my way to fly Qatar again? Having read the reviews of their A380 with the onboard bar, and still desperately wanting to try flying on an A350, I think I would definitely give them another go. However, would I go several hours out of my way to fly via Doha, for instance to route from Brazil back to London? Probably not right now. Of the three big Middle Eastern airlines, Qatar being in One World is a big plus for me, being able to earn tier points and Avios for my BAEC account. There is a flight from Rio to Buenos Aires on Emirates – I’d love to try that to experience Emirate’s service, although again it is operated by a 777 with the old business class, that I believe still doesn’t even have lie flat beds, although it does have First class. This was my first choice for this trip, but the timings didn’t quite work out for me this time, and the price in business was still rather high for the dates. Unfortunately, I’m not sure I’ll have the time to do it before I end up leaving Rio! via Dallas… Yes, it’s a slightly long way round, and there is a direct flight. But this was far more cost effective. AA run from GIG Terminal 2, the slightly newer and nicer of the two terminals at GIG (comparatively, as nice isn’t a word I’d use on its own)! AA’s check in is at the far end of the terminal, and had almost no queue on business class when we arrived about 2 hours before the flight. And about an hour later than planned due to Rio’s traffic…. The post security immigration queue was the longest I had ever seen in Rio, although normally I’m flying from terminal 1. All flights to the U.S. Go through 2, making it a lot busier with international flights I guess. But I still had nearly two hours in the AA lounge thanks to the crew being stuck in the same traffic, with the plane leaving about one hour late in the end. The lounge is nothing special. No ‘food’ per se, just snacks. But wine, and some seats. It was very busy today with not many seats left as every AA flight was late. The plane was a 767, with AA’s old 2-2-2 business product with angle flat beds. I really wasn’t expecting much; it had been years since I last flew AA, and by all accounts I wasn’t in for the best experience. So the seat itself met my not so high expectations. Certainly not up to a modern business class seat, but comfortable enough, and an angle flat is far better than an economy seat still. I managed a couple of hours of decent sleep. There is no built in IFE, instead about half an hour in to the flight Samsung tablets were distributed. It’s functional, but a somewhat bulky solution with a mess of charging cables taking up most of the space on the mini tray above. The seat controls were a bit odd I thought, in as much as how large and prominent they were. But simple enough to use. As I said, it is only angled flat, but can be comfortable enough in intermediate positions. The crew themselves were the real surprise though. With one exception, they were friendly and helpful. My wine was kept proactively refilled (although nothing special), the food was edible (but didn’t leave much impression other than the Sundae) and the Bose noise cancelling headphones welcome (I’d forgotten quite how noisy a 767 could be in comparison to a 777). Other airlines take note! I was expecting much worse from some stories. Immigration at DFW…. For me I was through fairly quickly. For those on a visa it was a different story. Well over an hour. Then a long transfer between terminals for the Domestic First leg to JFK. Things were a bit of a mess with some building work going on, and it was a bit confusing finding the lounge, having to go through what at first I thought was closed off! The Admiral’s Club lounge was big. And seemed deserted as a result, even though counting people there were a fair few. I was somewhat surprised to find alcohol wasn’t free, especially on a long haul connection… There was a proper bar, but you just had to pay. But as it was 7am in the morning I didn’t want anything either. The food options weren’t great, just cereals, fruit etc. Nothing hot. Generally domestic lounges in the US don’t offer the same level as European lounges I would say (the BA Galleries at Heathrow being a prime example). We had front bulkhead seats, enough legroom, only 2 abreast on a 737, and something resembling a cooked breakfast. No champagne though, which was disappointing. And finally, after 24 hours from leaving home, we arrived at JFK. My first post is going to be a cheat… I’m going to copy a lot of the post from a previous entry on my brit expat in rio blog, and expand on it a little. Over the last few years I’ve been flying quite a lot, heading back to Europe almost once a month in 2013 for various reasons… But I haven’t ever posted anything about airlines and my experiences. And as I thought I should post before the end of the year, here is my mini review for those coming to Rio! 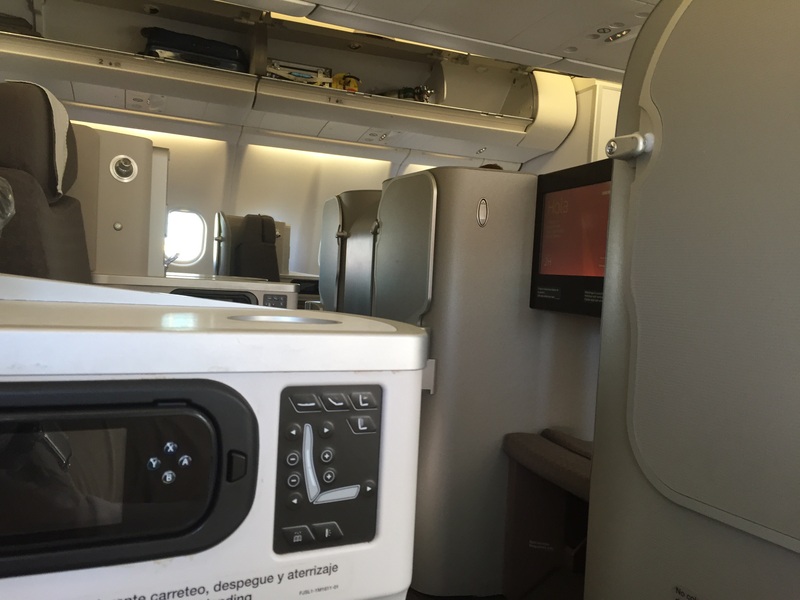 For this post, I am going to review my flight from London to Rio, via Madrid. Most of the time I am flying to London, and have used BA, but a few months back it was significantly cheaper to take the Iberia flight via Madrid, and only 3 hours longer overall, so I went for that route. I had travelled on Iberia twice before, but both times in economy (or Tourist Class) on a business trip. I had both the newer (A330) and the older planes (A340-600) with the older interior. This meant not even having any In Flight Entertainment in Economy… It isn’t an experience I want to repeat really… On the A330 the overall experience is quite similar to BA’s 777 on the Rio route. The IFE system is decent but not the biggest English movie selection. But a huge improvement on before still, although the seat recline is somewhat reduced from the older cabin I thought. This time though, it was was a holiday, and for holidays I always see the flight as part of the experience, and if I can I like to fly business, and I checked before booking that the flight was operated by the new A330, guarenteeing the new Business Plus cabin (the same cabin is being rolled out on the A340-600s – you can tell from the plane if it is the new or the old – an A340-500 = new business, an A340-200 or 600 = old business). Later in the year I have a flight booked on the old Business Plus, so I will share my thoughts about that to you then! For this flight, I selected a window seat (2L). As you can see on SeatGuru, there is only one seat on the window side of the aisles, but not all window seats are equal! Their new Business Plus is in a staggered layout giving 4 seats across in each row, although as it is staggered they alternate in layout – there is only one row of seats between the aisle and the windows so no one sits next to you, but on some you sit next to the window, others next to the aisle and the window is further away from you because of your table and storage are. Equally on the middle, two seats are together, then apart next to the aisle with the tables in the middle. So again, be careful if you are travelling alone – the middle ‘honeymoon’ seats could make for an uncomfortable journey, as you are as close as you would be in economy, but great for travelling as a couple. I have had a subsequent flight travelling with my fiancee where we took the middle two seats (row 1, 3, 5). Unfortunately I wasn’t thinking to take any good pictures, but snapped a couple. The seat itself has a massage function, and is quite adjustable, but the seat base move forwards in steps with a certain amount of recline available, then it moves another step forward for more recline, but due to the location of the leg rest / ottoman (fixed position) eventually you just have to put your legs up or have them chopped off! I’m a big fan of the ‘Z’ position available on BA’s Club World seat for watching a movie, which is unfortunately not available. Also the TV screen is fully fixed, so when very angled or in the bed position, the viewing angle to the screen is quite bad and it can’t be tilted down. There is a lot of storage space and a decent amount of privacy. BA’s is arguably more private at the window seat, but does not have no where near as much storage space to put things. And there is direct aisle access without the issue of having to step over someone’s bed in BA if they are sleeping! And to top it off, a nice wine selection too. Talking about the on board service, we were offered a small bag of L’Occitan products as well as the standard washbag – a nice touch with some nice hand cream, lip balm etc. but the washbag products were not great, I guess why the after addition! For the initial drinks service cava was offered along with a nice choice of olives as well as the more traditional nuts. The main meal had a decent looking selection on the menu. I selected a meat cannelloni. The table was well presented with a table cloth on the table, and there was very attentive service during the meal in taking away empty plates, refilling wine etc. But…. the meal itself though was quite a let down.. First I was served the wrong meal, and the cannelloni itself was something I might expect to find in economy I thought! However, one of the highlights of the drink service was the excellent Pedro Ximinez sherry and being offered a tasting of the two very enjoyable Spanish brandies on board. In general, the wines and drinks were quite decent. The steward looking after me was excellent, and all the crew spoke a good level of English. It’s also worth mentioning that the tray table itself is very stable, unlike the BA Club World table that can wobble quite a bit. Oh, and we also had some great views on the flight! Once the transformation of all the planes is complete, the new Iberia Business Plus is one of the better I have flown in as a hard product, and on this flight the service was also very good. But the food, and sometime the service as well can let Iberia down I’ve found. Also the IFE, although a good system, is lacking in English language movies. Nonetheless, I am now giving them far more consideration to them in the future, as the stop via Madrid doesn’t make the flight too much longer than the direct if it is a better buy. Unfortunately, there is no Premium Economy cabin still. 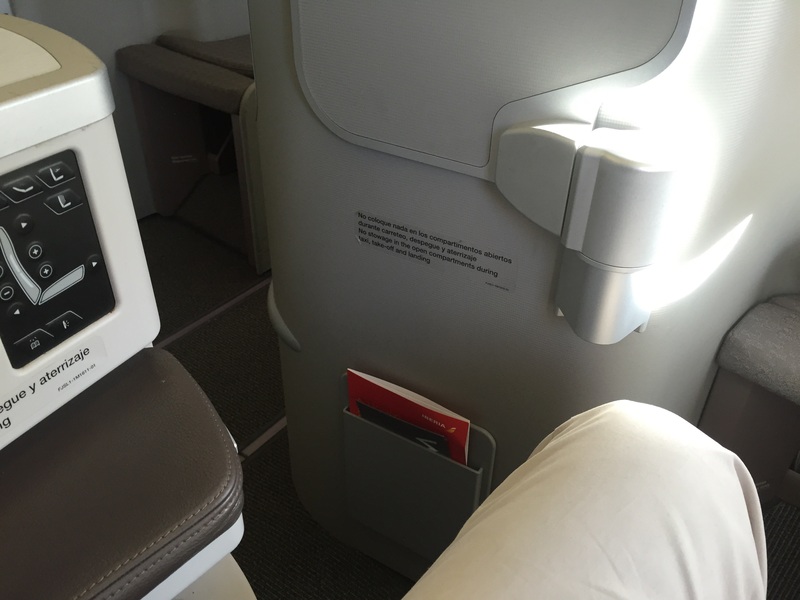 For the MAD-LHR leg, I flew in the new Club Europe cabin LHR-MAD…. Except, in a way I didn’t – I was flying on the new Club Europe cabin, and there is no longer a dedicated set of seats with more leg room – the whole cabin is the same, they just close off the middle seat with a table… This gives them flexibility to increase and shrink the Club Europe cabin – but it makes me question why am I paying more? Not having someone sit next to me… Of course you do get Champagne to drink, and the food is a little bit better. Of course there are other perks besides the flight experience itself, such as lounge access and priority boarding and exiting of the plane. The seat itself looks good and ‘classy’, but for a premium business class product, I really think this is a mistake from BA to reduce the leg room. The recline is all but non-existant (nice for not having the person in front intrude of course, but not so nice for me wanting to sleep a bit on my 630am flight). On a 45 minute Paris flight, who would notice… but on a 2.5 hour journey this is the sort of thing I would have been inclined to pay for… With a BA Silver card you get lounge access, priority boarding, business class check in (in fact even a Bronze card gets the last two). As I said, I have another Rio-London flight via Madrid bookedin December, and I’ll be flying on both the new and old Business Plus, and also a BA 767 for the connection to London, which should have the old Club World flat beds – for the same price the product can vary a lot! I have also flown in Iberia Business, which is similar to the older BA Club Europe product, just blocking off the middle seat, with a couple of extra inches of leg room. It is worth saying if you are flying economy, Iberia do not have a free food or drinks service in economy, unlike BA. Next up, a review of a recent flight in BA First London – Rio, American First New York – Sao Paulo, American Business Rio – DFW, and London to Edinburgh in a plane nearly as old as me it felt like… And some hotels perhaps!